I biked in Boston for 15 years, doing over 50 centuries in numerous events. To my recollection, in all that time I only ever received two medals as a result. The first was from the Audax Club Parisien for my first 200k brevet; the other was for the 2015 Cape Cod Challenge MS Ride. Although I rode 14 consecutive Pan-Mass Challenges, the most I ever got from them was a tiny pin; and that wasn’t for my riding, but for raising over $100,000 for them. Despite repeated mentions in my post-ride feedback, the PMC never gave ribbons or medals to finishers. I mention this to provide contrast with the two short years that I’ve lived in Pittsburgh, where I’ve received no less than eight medals and ribbons, as shown in the accompanying photo. A surprising number of rides here give participants something to go home with. 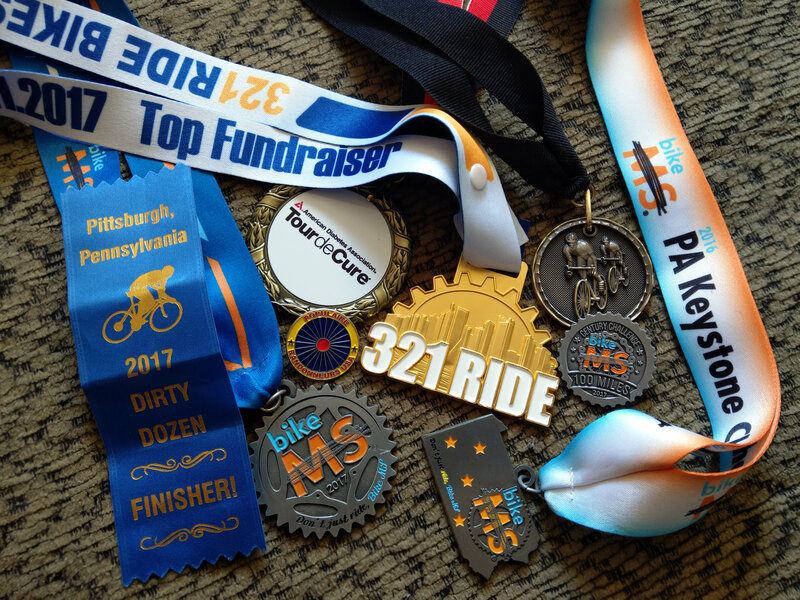 I’ve received three medals from two MS Rides (the extra one for doing their optional full century route), plus medals from a Randonneurs USA 100k brevet, the 3-2-1 Ride, the Pittsburgh Tour de Cure Gran Fondo, the PMTCC Three-State Ride, and my finisher’s ribbon from the recent Dirty Dozen. I should have received another ACP 200k medal, as well. And you know what? As tacky and worthless as those tchotchkes are, they still mean something to me. They bring back memories of those rides, and I enjoy watching the hardware accumulate by my desk over the course of the season. If I find them meaningful, I’m sure there are other riders who feel similarly. For anyone running a major event—especially a fundraising ride—such trinkets seem like a very inexpensive way to say “Thank you” and foster a rider’s loyalty to an event from year to year. I’ve certainly had very positive associations with the rides here in Pittsburgh that have given them out, so I’m not sure why folks in New England have resisted it.